With spring comes warmer weather, fresh blooms and spring showers. Unfortunately for dogs and their owners, spring also brings flea season. Instead of resorting to chemical treatments, try these natural options to keep the bugs away. Both flea ointments and flea collars are laden with chemicals — they’re designed to kill fleas, after all. When our dogs get fleas, we’ll do just about anything to get rid of them, but placing a chemical collar around your dog’s neck can have consequences of its own. Over the last five years, 1,600 pet deaths were attributed to flea treatments, according to The Humane Society. In addition, many of the ingredients in flea medications are known carcinogens in humans. If you have small children who come into contact with your pet, this could be of even more concern. While pets dying from flea medication is a severe side effect, poisoning and allergic reactions are also possible. Some signs to watch for in your pets that may mean they have been poisoned include salivating, dilated pupils, tremors, vomiting, hiding, shivering and skin irritation. If you do decide to use such treatments, be sure to follow directions carefully and pay close attention to dosage requirements by weight. This method will not kill existing fleas or eggs but spraying it on your pet early in the year may help prevent fleas altogether. Fleas spend a lot of their time off their host, so this may help ensure they don’t come back. 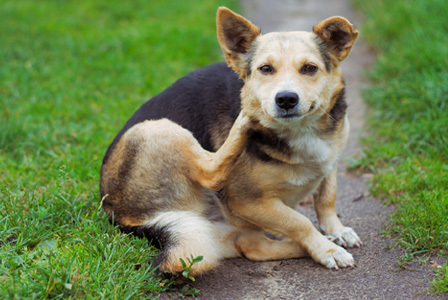 Fleas are repelled by both lavender oil and citrus oil, both of which are natural and harmless to your dog. Lavender can be harmful for cats, however, so avoid using it on them. Lavender has a calming effect on dogs, so you may notice your dog is more relaxed. Slice lemons into thin round slices with the skin intact. Add to a pot and fill with water. Bring water to a boil. Remove it from heat and let sit over night. Strain the liquid into a spray bottle and add lavender oil. Spray the mixture on your dog whenever he goes outside or after a bath. You can also spray or soak his collar in the mixture to make a flea collar of your own. The mixture can be sprayed on rugs, carpeting and furniture or even in your yard to prevent fleas from settling in from surrounding areas. Garlic can be toxic to dogs in large doses but small doses are safe. A small pinch in your dog’s food can help fight fleas. The familiar smell of garlic is actually emanated through the skin, and fleas want nothing to do with it. (Don’t worry, you won’t even notice it.) It also helps support the liver and kidneys in your pet. Apple cider vinegar offers a variety of health benefits for people and animals. It is packed with vitamins, minerals and nutrients and is especially helpful with skin issues. It also makes the skin more acidic, making it naturally less appealing to fleas. Other than lavender, essential oils like peppermint, lemongrass, cedar and pennyroyal can help fend off fleas. Mix a few drops of 100 percent essential oils into a teaspoon of carrier oil like olive oil and rub on the top of your dog’s neck or base of the tail. 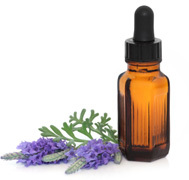 Most essential oils can be dangerous to pets in large doses so they should always be diluted; also avoid putting them in areas dogs can easily lick. Fleas also dislike rosemary. Make a bath by steeping rosemary in 2 cups of boiling water. Let cool and add up to a gallon more of warm water. Pour over your dog and let him dry naturally. Diatomaceous earth is basically ground-up algae, but it has an array of benefits and is specifically known for killing parasites internally. You should be sure that you purchase a food-grade version of DE or it could cause breathing problems and other serious side effects for both your dog and you. You can sprinkle a bit on her food or you can sprinkle it on her coat. DE has very sharp microscopic edges, which essentially lacerate any bugs that come in contact with it. You can also sprinkle this on your carpet, let it sit for at least 24 hours and then vacuum it up. Avoid washing your dog regularly during flea season, as it can dry out his skin. 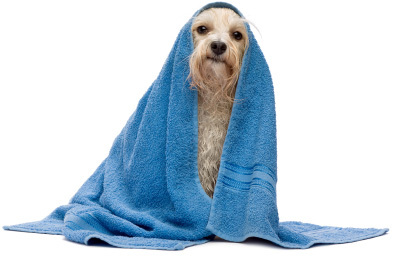 Most fleas will generally survive a basic bath, so keeping bedding and surrounding areas flea-free is more effective. Vacuum carpeting, rugs and furniture often and dump bags or vacuum canisters immediately. Wash your dog’s bedding in hot water regularly. When you do wash your pet, try using lavender-scented soap. Let your pet get wet, add shampoo to his back and rub to cover his body, paying close attention to his “underarm” area and back end. Let the soap sit on him for at least 10 minutes. Again, fleas are very resilient and this likely won’t kill eggs, but you may be able to kill adult fleas. Keep in mind that dogs can have allergies or reactions to both natural and chemical treatments. Begin treatments in small doses and pay close attention to any changes in your dog’s behavior or appetite. Discuss any concerns you have with your veterinarian.